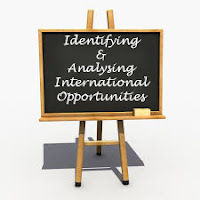 Question: How the international opportunities for business can be identified and analysed? Entire world is open to do business today. Technological developments in communication and transportation open national markets around the world. New technological developments, global economic conditions, worldwide population changes, increased competition, legislative requirements, and political events are some of the factors affecting current and future marketing activities of the organisations around the world. In this post we are going to explain - how to screen and analyse locations as potential markets and as potential sites for operations. Also, how to conduct international market research. Basic Demand - For a potential market this step entails determining basic demand for a product. Available Resources - For a potential site this step involves determining the availability of resources required to undertake production, R&D, or some other operations. The first step in the process of searching potential markets is to find out whether there is a basic demand for the organisation's product. Understanding of country's climate is important in determining basic demand. For example - What is the use of selling snowshoes or snowboards in a country which receives no snowfall. Certain countries also ban specific products. For example - Alcohol is banned in many Islamic countries. Organisations require particular resources to carry out local business operations. Raw material needed for manufacturing must either be found in the national market or imported. Imports may face tariffs, quotas, or other government barriers. Labour is another important resource essential to production. Many organisations relocate to lower-wage countries, especially those with labour-intensive products. Financing can send production abroad if it is not available at home or when interest rates are high at home. Locations where these resources are found locally and economically are preferred most. Markets and sites not meeting requirements are dropped. Attitude towards business, language, religious beliefs, customs, and traditions are different in different countries. These elements can influence what kind of products are sold and how. Cultural elements such as work ethic, educational attainment, or the level of managerial skills of the local people affect site selection decisions. Government Regulations - A nations attitude towards trade and investment, types of restrictions on imports, types of investment barriers, and environmental regulations can attract or discourage foreign investment. Government Bureaucracy - Lean and smoothly operating bureaucracy can encourage investment while an inefficient, cumbersome, or corrupt one can discourage it. Political Stability - Companies must monitor political events that threaten operations and future earnings. Political risk can threaten activities of any international business activity. Poor fiscal and monetary policies can increase inflation and budget deficits, weaken a currency, lower productivity levels, and slow innovation. These reduce investor confidence and cause companies to scale back or cancel proposed investments. Cost of Transporting Materials and Goods - Can affect where manufacturing facilities are located. Logistics is managing the physical flow of products from point of origin as raw materials to end users as finished products. Country Image - Embodies all facets of a nation’s business environment and affects the selection of sites for any activity. Country image can be good for certain products but unfavourable for others. Despite local demand for a product or availability of resources, consumers might not be ready or able to purchase a product or certain sights many not be able to supply needed. A. Measuring Market Potential - Different levels of economic development require varying approaches to researching market potential. i. Sufficient information on market potential is available about industrialised countries. Names, production volumes, and market shares of largest competitors. Volume of exports and imports of the product. Structure of wholesale and retail distribution networks. Market background, including population, social trends, and marketing approaches used. Total expenditure on product (and similar products). Retail sales volume and market prices of product. Future market outlook and potential opportunities. iii. These reports provide a quick overview of the size and structure of a nation’s market for a product. iv. One way to forecast market demand is to determine a product’s income elasticity-sensitivity of demand for a product relative to a change in income. Calculated by dividing a percentage change in the quantity of a product demanded by a percentage change in income. v. Income-elastic product: demand increases in a greater proportion to increase in income. These are discretionary purchases such as video games, jewelry, etc. vi. Income-inelastic product: demand increases less relative to increase in income. These are considered essential and include food, utilities, beverages, etc. i. Companies often face a lack of information about emerging markets. Data on market size or potential may be unavailable. Market Size - snapshot of market size at the moment. Market Growth Rate - Identify large (but shrinking) markets and small (but expanding) markets. Market Intensity - Estimate a market’s wealth or buying power (both individuals and businesses). Market Consumption Capacity - Estimate a market’s spending capacity. Commercial Infrastructure - Assess channels of distribution and communication. Economic Freedom - Estimate extent that free-market principles predominate. Country Risk - Estimate risk of doing business, including political, economic, and financial risks. iii. After analysing each factor, the importance of each to demand for a product is determined; then potential locations are ranked according to their market appeal. Managers must assess the quality of resources they will employ locally. For many companies, the most important resource will be labour and management. Wages are lower if labour is abundant, relatively less skilled (though perhaps well-educated), or both. Yet, training local managers requires a substantial investment of time and money. Companies must assess the productivity of local labour and managers; low wages may reflect low productivity levels. Managers should examine local infrastructure, including roads, bridges, airports, seaports, and telecommunications systems; each can impact efficiency. Represents intensive efforts of assessing remaining potential markets and sites. Managers visit each location to confirm earlier expectations and perform a competitor analysis. Managers evaluate each potential location’s contribution to cash flows by undertaking a financial evaluation. i. Field Trips - Trips to each remaining site let managers experience the culture, observe the workforce, or make personal contact with potential new customers and distributors. Number of competitors in each market (domestic and international).